Now that you have entered the world of Elvenar, it is time to step up the game and take it to another level. We have written a comprehensive guideline for beginners and now we are digging a little deeper to help you become more effective in building your empire. Elvenar is a strategy city-building simulation game that takes you into a fictional world of Elves. The goal is simple, build your own town, create a stronghold and establish a sustainable community. Although everything in this game is easily manageable, you can still incorporate some effective strategies to progress faster. If you have started the game already then picking a race may no longer be applicable since you can only pick a race once and you have to stick with it. However you can always create a new account if you wish to. Anyway, the game allows you to choose between two races; Humans or Elves. Although both races are very similar to each other , they still offer unique aspects that create notable distinction between them. The Technology Tree for example is unique for the first five chapters of the game. Same thing goes with the Residences and Factories. The armies are also different for each race. Elven army is more defensive in nature while Humans are typically more focused on offenses. 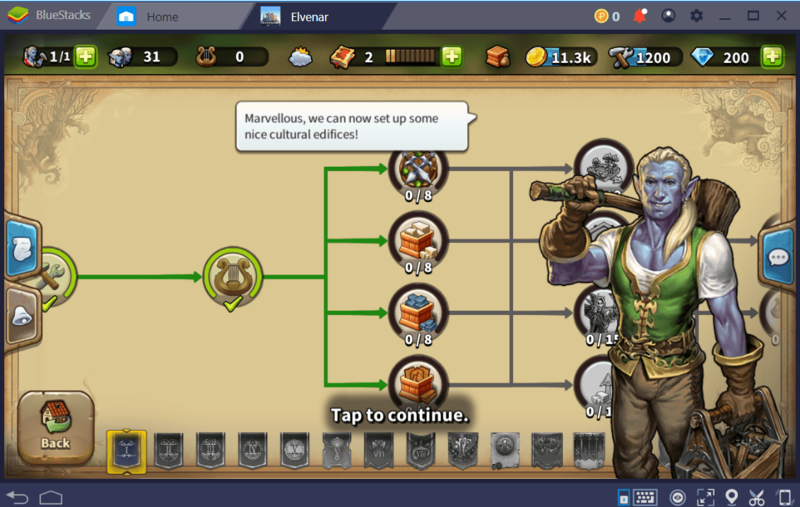 Tips: If you really want to explore both worlds, then you might want to take advantage of BlueStacks 4 Multi-Instance feature. Unlike the typical MMO Strategy, Elvenar will not focus on competition. They offer Fellowship system instead of the classic Guild-building concept. Therefore, you do not need to engage yourself with guild wars. Through our BlueStacks 4 Multi-Instance feature, you can play the same game on two or more separate windows using different accounts. For Elvenar, you can play a Human race on the main account and explore Elven race on the newly created instance and vice versa. Typically, BlueStacks Multi-Instance function works effectively with competition but if you want to experience both worlds or just in case you find it hard to progress faster due to bad decisions, you can always use this function to your own advantage. For a city-building game like Elvenar, creating a sustainable community is a must. You must learn how to utilize everything in order to progress faster. Generally, you should always pay attention to your town’s status meter located on the top most portion of the game screen. Each of them plays a crucial role in Elvenar. Allow us to explain each icon. 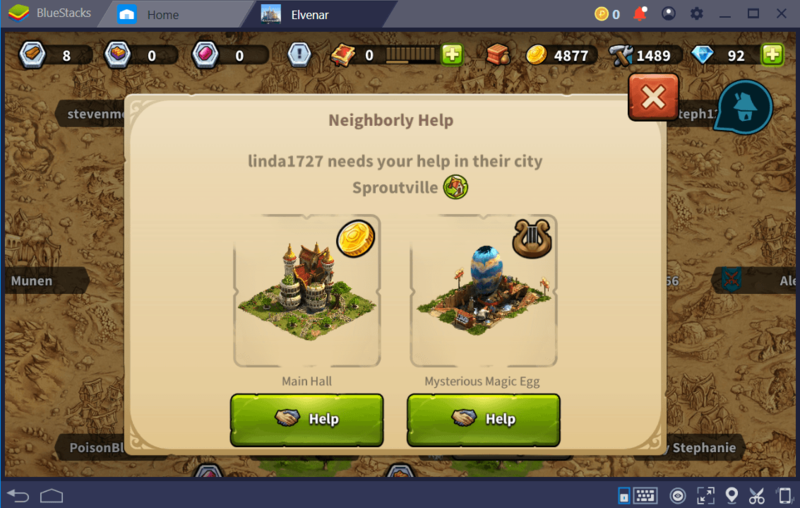 Builder – Located on the upper left corner of the game screen is an icon that indicates the active builder you have for your town. Builders are responsible for constructing facilities in the town. Basically, the more builders you have, the faster you can create buildings. Builders can be hired through Builder’s Hut and you can purchase them through premium gems. Population – Population will define how successful your town is. The higher the population, the more taxes can be collected. To increase population, you must build residences and upgrade them to accommodate more people. Culture Points – Culture points are earned every time you place a Culture Item on your town. Unlike residences, workshops and factories, culture items can be placed randomly on the map. Culture items allow you to collect more taxes and allow your workshops to produce more supplies. Knowledge Points – Probably one of the most important elements in the game are the Knowledge points. These points are used to conduct Research while Research is needed to unlock new features. Knowledge points however are quite limited. You only earn one point per hour so better consume it wisely. Coin Storage – Gold Coins are your virtual currency for Elvenar. They are mainly used to purchase new buildings and also to buy upgrades. You can collect Gold coins in many ways. One of which is through tax collection. You also earn coins by helping your fellow players or by completing your quests. Supplies – Much like Gold coins, supplies are also important resources in the game. You need them in upgrading buildings and also as part of Negotiating Cost in solving Encounters. You earn them through workshops and also through scouting. Diamonds – Diamonds are considered as the premium currency in the game which allows you to purchase special items and also to expedite production time. 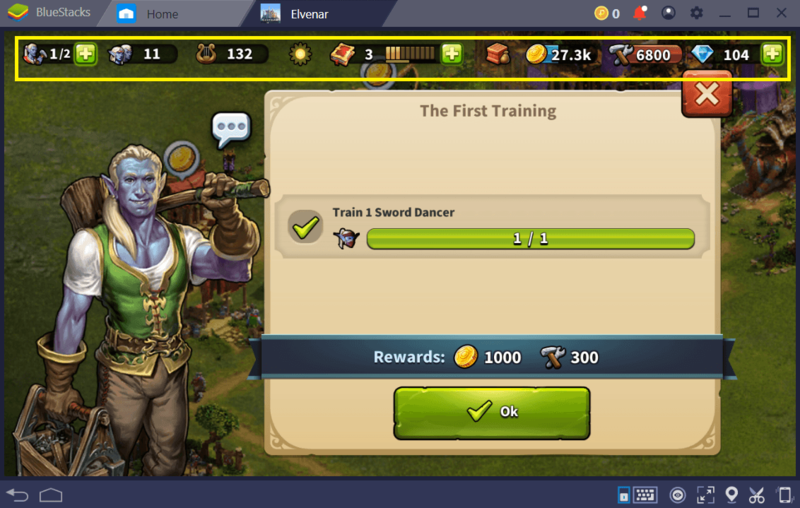 You can earn diamonds by purchasing them through in-game shop and also as rewards when completing special quests. Trick #1 : Running out of Knowledge Points and Coins could be very frustrating. Basically, running out of resources slows you down. Knowledge Points for instance take a total of 10 hours to refill the bar completely. During our time with the game, we encountered a quest that required us to unlock a feature via research but we had no knowledge points at the time to spend. Interestingly, there is always a way to earn Knowledge Points even without spending real money. The ultimate solution to earn Knowledge points instantly is through scouting. Visit the World Map and scout nearby provinces. Every time you solve an encounter, you get knowledge points in return and you don’t have to wait an hour just to earn one. 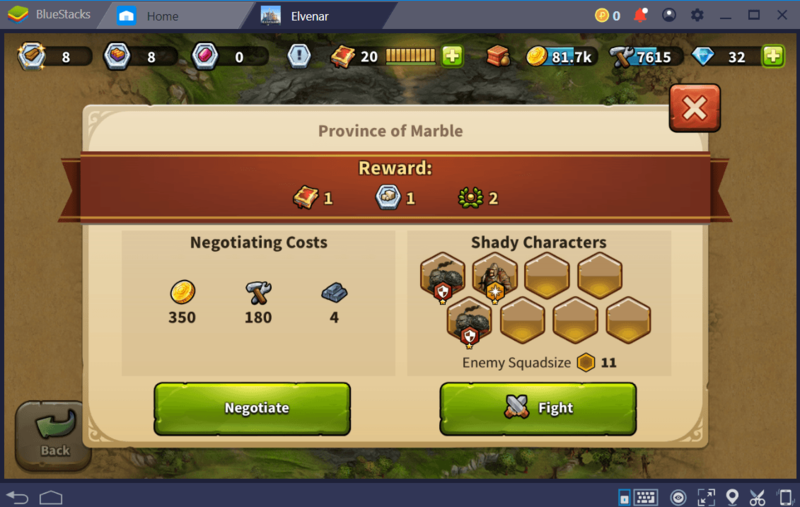 Interestingly, you can always scout new provinces as long as you have enough coins and supplies to pay for the Negotiating cost. Trick #2 : If you run out of coins, you can always earn some by doing other tricks aside from collecting taxes. Much like Trick #1, you earn additional coins by scouting nearby provinces. Instead of solving encounters, you visit cities from other players. Again, Elvenar promotes a friendlier approach. You visit other cities not to attack but to help them with their current quest. Offering them a helping hand allows you to earn coins in return. Same thing goes with Fellowship, you help your members and earn coins from it. Completing a Quest Line also allows you to earn bigger rewards. Trick #3 : One thing about City Building simulation is that it always takes some time before you can appreciate your progress. For some impatient gamers, the first phase of town building and scouting can be very boring and we completely understand that. 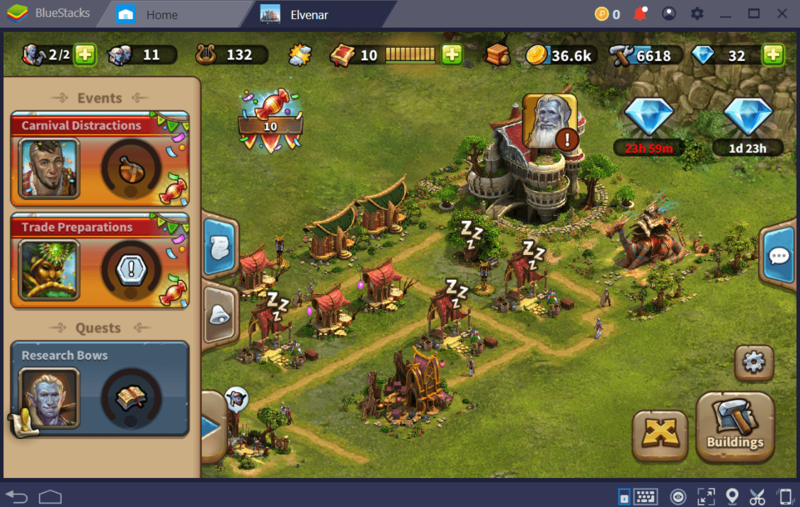 When it comes to fast progression, BlueStacks 4 Combo Key feature can become extremely handy. This feature allows you to record all your actions and perform them repeatedly using a single shortcut key. 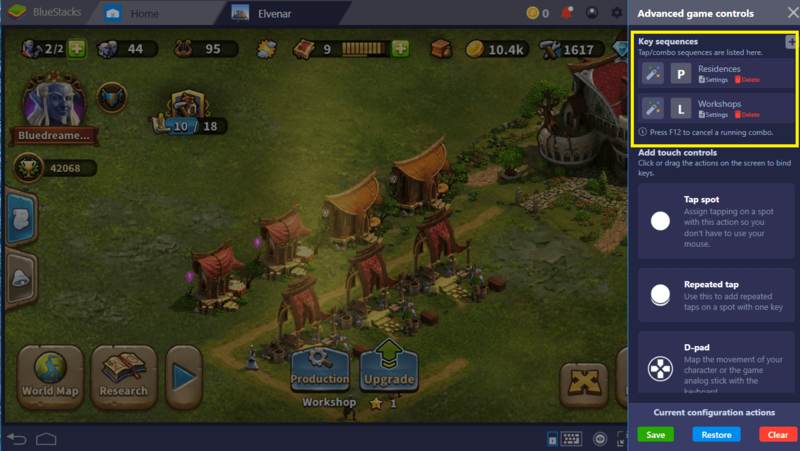 How to Use BlueStacks 4 Combo Key Function in Elvenar? Simply click on the Combo Key icon from the task bar (the keyboard icon) to access the Advanced Game Controls screen. On the uppermost portion of the panel , click the plus (+) icon beside the Key Sequences. This will open a set of buttons. Click on the Start Button to start recording. Make sure you know exactly what to record before hitting the start button. Click on all the Residences and collect the taxes and then save. Assign a Shortcut key and you’re done. You can now collect all taxes in just a single key. This allows you to collect taxes or supplies easier and faster. Trick #4 : Quests are very important in Elvenar and completing them is the only way to progress. We suggest sticking with your quest and refraining yourself from doing actions that are not necessary. Upgrading buildings for instance, can be done anytime. If you upgrade a building (without following any quest) and yet the next quest requires you to upgrade the same building, you’ll end up spending more money and wasting more time. Also take advantage of the special limited edition quests as they tend to offer bigger prizes. Now that you have all these useful tips and tricks for Elvenar, it is time for you to apply these in your own world. The game is constantly being updated and from time to time, you’ll encounter a bunch of great events and new features to explore. 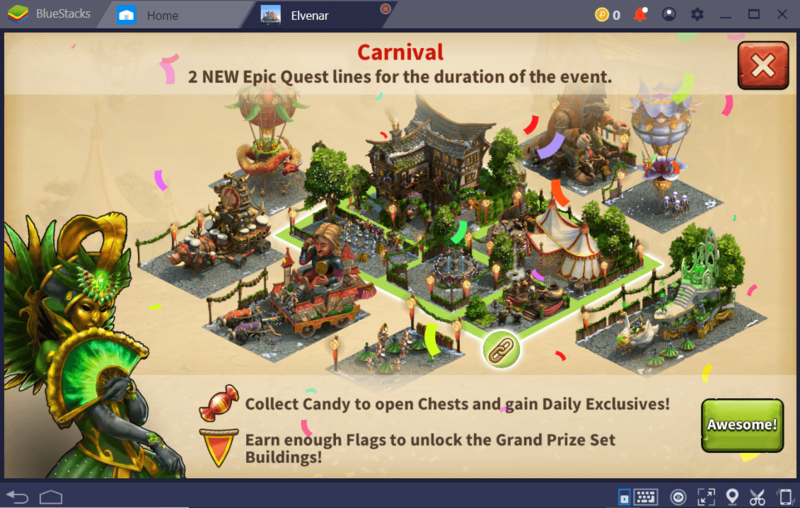 Feel free to explore Elvenar on BlueStacks 4 and see what else this exciting city building simulation game has to offer!